The following questionnaire is a very helpful tool when conducting an examination or a detailed interview to find what remedies are necessary to treat an individual in a specific situation or life circumstances in which needs treatment or can benefit to take the remedies. The questionnaire below contains valuable tips on each aspect of the respective flower essence at play that can be of aid. One of the most important diagnostic instruments for finding the appropriate Bach Flower Remedy is the patient's interview. At BFT, we also diagnose and treat through intuitive readings and oracles, but here, we want to present you a more logic and rational way to complete a treatment plan which it is also a good way to assess and create a treatment plan. Following Edward Bach's advice in his first volume, he mentions that the Bach Flowers are "​flowers that heal through the soul." In the process of choosing what flowers will be the most appropiate ones for your healing, becoming aware of the emotional causes of your present complains is of utter importance and it can be explored via interverview. It also becomes clear that unless one really has a deep knowledge of oneself, opting for self-treatment is a difficult task and might not very effective, except in acute existential disturbances, in which the negative emotional state is quite obvious. Often, it is very helpful to have a counterpart who is objective to our problems and can mirror back to us what we cannot objectively see. In this case, a Mental Health Couselor (Psychotherapist) and/or a Bach Flower Practitioner who really knows the Bach Flower system and has the right knowledge and therapeutic skills can help us to be aware of our mistaken attitudes and behaviors, because he/she has the necessary training/knowledge and the necessary distance from our problems to help us along the way when taking the remedies. He/she can also help us review accordingly our personal progress. Another important reason for the interview is the persons' need to be aware of the desired effect of the flowers on the psyche. This can prevent them from panicking if a potential reaction or a preliminary worsening of their symptoms occurs. The effect of the selected flowers should be explained at the end of the session. We want to highlight that it is always beneficial to acquire some literature about Bach Flower Therapy and read about the different flowers at home once they are prescribed. In BFT we strongly recommend that to be familiarized with the qualities of each flower containing your formula. For this reason, we created this website to help you to be familiarized with each flower and its application. It is then when you can put your efforts at play to self-model your attitudes and behaviours consciously. Therefore, surely we can assert that for the benefit of treating on-going psychological patterns (personality types), the remedies can be of great aid in order to start modifying those traits that are getting in the way of finding your fulfillment. Quick recovery, improvement and spontaneous remision can be the case of a very effective treatment but Bach Flower Therapy like any other healing modality, in the real practice and motivation for finding a cure, in most of the cases, require time, introspection, and analysis. Therefore, being ready and motivated to find the right cure with the flowers, willing to learn about yourself, plus finding a good consultant to support you in this process is of great importance. As we mentioned earlier, the following questionnaire is of great help to conduct a detailed interview or do a preliminary or in-depth check-in as desired. This also contains valuable information about the respective flowers that can be the key for a particular treatment and the creation of your own personalized formula. 1. Are there situations in which you feel discouraged or desperate? Sweet Chestnut: I believe that I will fall apart. I am feeling very desperate. Crab Apple: I see myself as unclean. I condemn myself for my faults and errors. Star of Betlehem: After experiencing an emotional shock, accident, or death of a dear one. Elm: I feel not strong enough to do a certain tasks or jobs; I am feeling overwhelmed; for example, before taking an exam. Willow: I feel unfairly treated, and in consequence I become embittered. Oak: I am drained and exhausted but I continue to work on out of a sense of responsability. 2. What are you worried about? Gentian: I am concerned about my future. I lost my hope. Red Chestnut: I worry about other people and that something might happen to them. Heather: I am just focused about myself. I am an hypochondriac. Chicory: I watch over the needs of others. I am overprotective of them. 3. Do you sometimes feel lonely? Impatiens: No one can keep up with my work speed, I would rather prefer to work alone. Heather: I very easily feel lonely. I always need someone around me. Water Violet: I have difficulties making contact with others. I tend to withdraw and isolate. I am better alone. 4. In which situations are you influenced by others? Walnut: In a phase of starting something new I start doubting. Centaury: I lack of will power. It is very hard to say "no." Agrimony: I am the entertainer of every party. Holly: I get easily irritated and I feel mad very quickly. 5. Are there situations in which you are afraid? Aspen: I tend to feel an indefinable and vague fear. Mimulus: It is a concrete fear. Rock Rose: An acute panic. Larch: I hold bad expectations of what will happen, experiencing high anxiety and fear of failure. Red Chestnut: I am worried about other people. Cherry Plum: Fear of going crazy or freaking out. 6. Are there situations in which you react intolerantly? What annoys you the most? Vervain: I come up against another person's opinion. I try to convince others. Heather: I am absolutely egocentric. I want to be the center of attention. I don't let other people talk. Holly: I don't put up with anything. I am aggressive. I hate to be passive. Beech: Almost all situations. I moan and lecture others because I simply teach them what is correct. Impatiens: When or if someone is slower than me I cannot tolerate. Rock Water: I am intolerant. I react against a different ideology because I don't accept anything else. 7. Are there situations in which you feel insecure? Gorse: I go with no hope. I don't believe in life or anyone anymore. Cerato: I often ask people for advice in order to decide. Gentian: I doubt of everything. I am easily discouraged. Wild Oat: I don't know what I want. There are too many options, therefore I am confused. Sclerantus: Every problem has two possibilities that is hard to decide. Hornbeam: I am mentally exhausted and I question my own capabilities. 8. Do you solve your problems with the help of others? Cerato: I need to ask to other people for advice. Heather: I need a shoulder to rely on. 9. Do you find yourself frequently making the same mistakes? Chestnut Bud: It is hard to learn from my mistakes. Centaury: I hardly say no to anyone. I always reapeat the same mistake tricking myself. Clematis: I simply don't pay attention. I am daydreaming all day long. 10. To what do you tend to react sensitively? Gentian: I experience failure when I am easily discouraged. Mimulus: When loud noises, bright light, to cold environtments, to other people's behavior affect me. Centaury: Resentment, the feeling of not being accepted by who am I.
Agrimony: To environmental disturbances, for example, music, soft noises, noisy crowds. Pine: To accusations from others that make me feel guilty. Larch: To criticism and reproach due to my lack of self-esteem. Vervain: To injustice and unfair situations. Impatiens: People who work slower than me, they drive slow and I can't do my way. Chicory: To ingratitude, rude and unpleasant behavior of others I tend to mother them. 11. Are you more an optimistic or a pessimistic person? Agrimony: I pretend to be an optimistic person but in reality, I carry many sorrows. Gentian: I am more pessimistic type. 12. Are you careless about minor details? Wild Rose: Because of resignation. Wild Oat: Because nothing has meaning. Clematis: Because of lack of attention. My thoughts are somewhere else. Chestnut Bud: I postpone unpleasant tasks, many things appear unimportant to me. Water Violet: I feel I am above the existing order; "those who need order are too lazy to search - the genius has a general overview"; in certain areas, on the other hand, I am a perfectionist. Heather: In children: to get attention, even if this means disciplining or spanking for them. Hornbeam: Because of exhaustion, although this is usually not my nature. Mustard: Because of feeling of an inner emptiness, only during melancholic phases. 13. Are there situations that weigh heavily on you? In what kinds of situations do you feel tense? Impatiens: I feel impatient, nothing goes fast enough. Rock Water: I frantically hold on to my moral values. Cherry Plum: I am in constant inner tension, to not lose control. Beech: I always criticize something. I am in constant negativity and that makes me a tough person. Vervain: I cannot relax. I want to convince other people so badly, therefore I have a hard time letting go. Oak: I am totally tense. I often work beyond my limits until I reach my second wind. Agrimony: I experience inner nervousness when I go to sleep. 14. Do you react to unpleasant feelings with anger or rage? Larch: I have a very low self-esteem. I can't easily defend myself. Beech: I reproach others and look for their mistakes. I tend to be hurtful to others with my clever remarks. Water Violet: I simply withdraw and I look at hassles as beneath my dignity. Holly: I tend to react impulsively. I yell at others sometimes, and I have a difficult time calming down. I later feel resentful. Centaury: I am quick to give in to maintain a peaceful ambient. 15. Do you solve your problems on your own or alone? Agrimony: I don't admit my problems. I hold a cheerful facade. Water Violet: I am too proud to accept help from anyone. 16. Do you lack concentration? Are you easily distracted from your tasks? Wild Rose: I have no interest. I am distancing from people, indifferent. Mustard: I feel melancholic, an unexplainable sadness. Olive: I am exhausted and absolutely devastated. Clematis: I am a daydreamer. I live in a fantasy world. Honeysuckle: I live in the past. White Chestnut: I cannot relax. I experience annoying thoughts of all sorts. Chestnut Bud: I am always two or three step ahead in my mind. 17. Do you have thoughts that you can't let go of and constantly occupy your mind? Do you talk to yourself constantly? Clematis: I have many different fantasies and daydreams. Pine: I have tormenting thoughts. I make excuses for myself. White Chestnut: I can switch off my thoughts. Chestnut Bud: I am always two steps ahead in my thoughts. 18. Do you worry about the well-being of other people? Beech: I think I have to point out what others do wrong. I criticize and reproach them. Chicory: I am overprotective of others. Rock Water: I hold strict moral ideas of what is right and what is not. I want to be a very good example for others. Vine: I know better and often I force my will onto others. Vervain: I believe that I can convince anyone of my vocation and mission. 19. What do you think when you have time to ponder about yourself and life in general? White Chestnut: I can't stop thinking and having recurrent thoughts on..
Star of Betlehem: Unpleasant things of the past. Chestnut Bud: About other people in my life, whether they are doing well or not. Clematis: Plans for the future or fantasy like dreams. Willow: About injustices done to me. Honeysuckle: Pleasant things of the past. 20. What keeps you from being completely happy? Wild Rose: I give up. Everything appears meaningless. Gorse: I feel deperate. No one can get me and help me. Wild Oat: There are no perceivable goals. Olive: I am completely exhausted, thinking only to crash on my bed. Holly: My own anger keeps me prisoner. Rock Water: Repressed wishes and desires. Sweet Chestnut: Deep despair. I have no hopes that things will go better in any way possible. Pine: I have guilt feelings and remorse of my behaviors and actions. Crab Apple: I feel dirty on the inside, soiled, feeling like I commited something wrong or sinful. Water Violet: I am above of the simple pleasures of life. I am withdrawn from life. Star of Betlehem: My own emotional trauma. Vervain: I will be happy only if I reach my own expectations. Scleranthus: My own idecision of what makes me happy. Gentian: Exogenous reactive depression, pessimism and depression. Agrimony: I appear to be happy from the outside but I am not in the inside. Hornbeam: I am too exhausted to feel joy about anything. 21. Can you speak in public to an audience? Do you wish you had more self-esteem and stamina? Centaury: lack of will. I hardly can say no. Larch: I experiece lack of self-esteem. Cerato: Lacking trust in my own ability to judge things by my own criteria, I tend to ask others for advice. 22. What makes you angry or upset? Vervain: Myself when I don't fulfill my own expectations. Rock Water: After I ignore my own values or I go against my conscience. Holly: Everything makes me uncomfortable and I tend to get angry very easily. Impatiens: Having to wait for everything. Centaury: Myself because I can't say "no" to things I don't want or "yes" to things l like. Beech: The stupidity or ignorance of other people. 23. Are you a perfectionist? Crab Apple: I have to do everything perfectly, otherwise I feel badly. Vervain: I want to proof myself all the time. I have extremely high self-expectations. Rock Water: I try to prove my point to other people by being a role model. I am simply an idealist. Water Violet: I want to be better than others, therefore I justify my feelings of superiority. Heather: I want to be the center of attention. I need an audience to see me. Centaury: I need to be liked by others, if not I don't feel good enough. 24. What makes you feel exhausted? Oak: I am overworked but I continue to work out of a sense of duty. Olive: Complete physical and psychological exhaustion after illness or phases of big ammounts of work. Centaury: I am drained by the presence of other people, overworked by too much helpfulness. Hornbeam: By mental exhaustion after too much intellectual work, studying or reading late at night. 25. Do you sometimes feel sad? Gorse: I feel sad with no hope. Sweet Chestnut: I have absolute despair. Gentian: Exogenous reactive depression by known reasons for sadness. Wild Oat: I don't see any meaning or any worth goal in life. 26. Do you enjoy to be comforted when you are feeling sad? Heather: I do, as I have a deep desire for solace. Agrimony: I hardly tolerate another person comforting me. I deal with all myself. 27. Do you react to unpleasant feelings with sorrow? Gentian: I simly give up as I am easily discouraged. Heather: I wail and lament. Star of Betlehem: I am shocked or overwhealmed. Agrimony: I don't speak to anyone about my problems. I deal with them alone and try to move on. Gorse: I feel desperate and hopeless. 28. Have you ever been without hope, or resigned? Do you tend to give up? Sweet Chestnut: I see absolutely no way out. I am completely at the end of my rope. Gentian: I feel easily discouraged and doubtful. Wild Rose: I resign. Inner capitulation. Gorse: I am desperate. I believe no one can help me. 29. What is dissatisfying to you? Wild Oat: I can't find my goal in life and I don't know what to do about it. I lack perspective. Impatiens: All goes very slowly. Hornbeam: I am really exhausted and I am not productive. Vervain: Due to high expectations of myself I feel dissatisfied. Pine: The mistakes I have made and my guilty feelings about it. Rock Water: I don't live up to my values and morals. Chicory: My son or daughter-in-law. Ingratitude. Water Violet: All seems too banal. I look for special things because I think of myself as being special. 30. Do you sometimes feel unclean in some ways? Are you bothered by dirt? Crab Apple: Disgust with everything having to do with the body. Fear of dirt, to infection/s, sweat. 31. What do you do when other people have a completely different opinion from yours? What would you do if you had to do something that you resent with all your heart? How do you assert yourself in your work, with your family or other environtment? Impatiens: I try to resolve an issue as soon as possible and often overreact because of my lack of patience. Chicory: I use a diplomatic approach telling the others what is important and that they should be grateful. Vine: I become violent or agressive threatening with negative consequences. Rock Water: I stick to my core principles. Even under extreme circumstances I would risk my job. Vervain: I try to convince others at all costs. 32. Are you a good listener, or do you often take over a conversation? Impatiens: I am impatient and I interrupt other people. Vervain: I want to convince other people of my predicaments. Heather: I don't listen very well to what others have to say. I direct the attention to myself. I need an audience. 33. Do you mind if you have to wait? Impatiens: I am an impatient type of personality. Holly: I am angry and bitter all the time by jealousy and envy feelings. Gentian: I am always afraid that is too late for my turn. Cherry Plum: I am sometimes afraid of going crazy (it can apply in people who takes drugs). Beech: I complain to others about the person who makes me wait. 34. Do you sometimes feel superior to other people? Rock Water: In a moral sense yes. I perceive other people as coward, ignorants, sinners. Water Violet: I think of myself as better than others. 35. Do you tend to have feelings of guilt, jealousy or envy? Do you feel you have unfairly treated by somebody else? Is there someone whom you cannot forgive? Crab Apple: I see myself unclean, sinful, and soiled. Pine: I feel guilty for what I did or how I approach, what I said, what I did. Holly: I feel jealous and envy. Willow: I am embittered and I feel like a victim. 36. Are there things you consciously avoid because they go against your general principles? Rock Water: I am focused on my principles. I suppress my own desires. 37. How do you behave when you have to make a decision? Is it sometimes difficult or hard for you to make a decision? Sclearanthus: I feel torn apart. I can't decide between two options. Wild Oat: I can't decide among several options. Hornbeam: I often can't decide to get out of bed. Cerato: I need confirmation from others. Walnut: I feel insecure in a new phase of my life, therefore, I can't make right decisions. 38. What would you most like to change about yourself? 39. What is missing in your life or in your personality? 40. How your ideal self looks like? (1) Self-Edited Image. 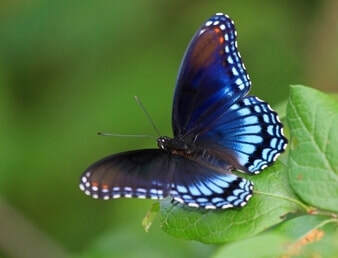 (2) Copyright Image: <a href='https://www.123rf.com/profile_mariedaloia'>mariedaloia / 123RF Stock Photo</a> - Stock Photo - Red Spotted Purple butterfly resting on a leaf in Maryland during the summer. Autorship of the text: Roser Camats Falip.